If New York Fashion Week's designers have anything to say about it, Spring/Summer 2016 will be all about the shoulders. In recent seasons, we've seen off-the-shoulder styles reign on the runways and in the streets, however the cold-shoulder look so prevalent at last week's NYFW leaves just the shoulders bare in a way that can be chic and flattering for anyone at any age or any size. Let's take a look at how this trend was interpreted by various designers. Romantic in floral print at Calvin Klein Collection. 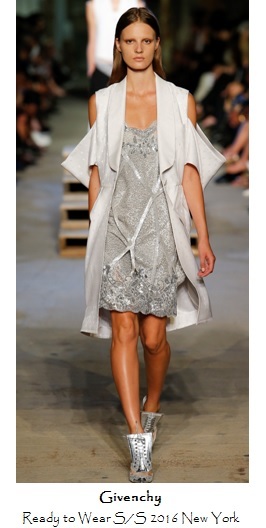 Christian Siriano's version highlighted the trend with an embellished detail. At Creatures of the Wind, a sleeve in a different fabric and print was used beautifully. A billowy Derek Lam gown brought the trend to evening wear. Givenchy presented a modern coat with slouched sleeves. The low-slung sleeves on this Prabal Gurung sweater make for a cool, relaxed vibe. Proenza Schouler's LBD looks modern yet feminine with cold shoulders. Gauzy and light, this Rachel Zoe dress gives a peek of shoulder. At Rebecca Minkoff, the draping at the shoulders of this printed dress added to the boho-chic feel. Exotic prints and strappy shoulders were on display at Reem Acra. The shoulder cutout on this Vera Wang sweater gave this cute look an edge. Simple in white, Wes Gordon's cold-shoulder top could be a Spring wardrobe staple. Tuxedo dressing was given a twist at Yigal Azrouel, with the unexpected shoulder cutout. From day to night and from glam to sporty, the cold-shoulder trend works for any style or occasion. Will you be trying this trend?